Christmas is just two weeks away! Is your fruit soaking? Perhaps already baked into fruit studded, rum brushed cakes waiting to be unwrapped? I can imagine goodies being baked and stashed away to make delicious gifts! If you are yet to start preparations for the festive season, may I suggest Quick Mincemeat ? 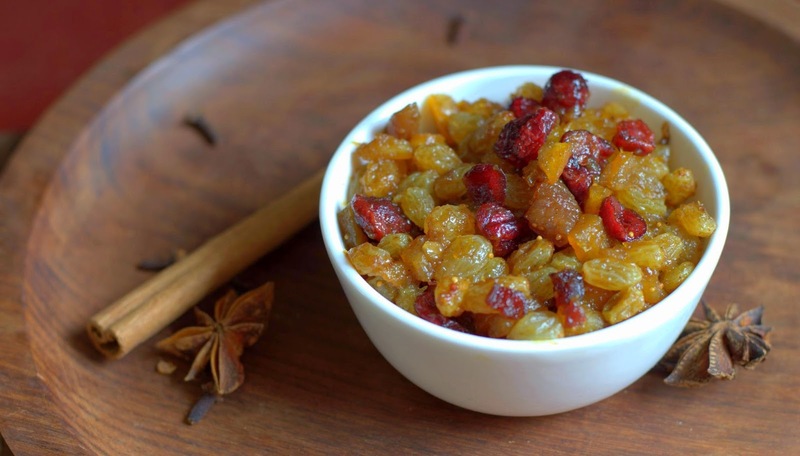 Moist dried and fresh fruit with a citrussy zing and the aroma of warm spices. Have a spoonful for dessert or toss some into apple and pear based desserts like cobblers, pies and crisps. You could even fold it into ice cream as David Lebovitz does. Should not be bad in a cake batter either! Add this to your list of homemade Christmas gifts for folks who will appreciate it. Especially since you can't buy mincemeat at a store here in India. 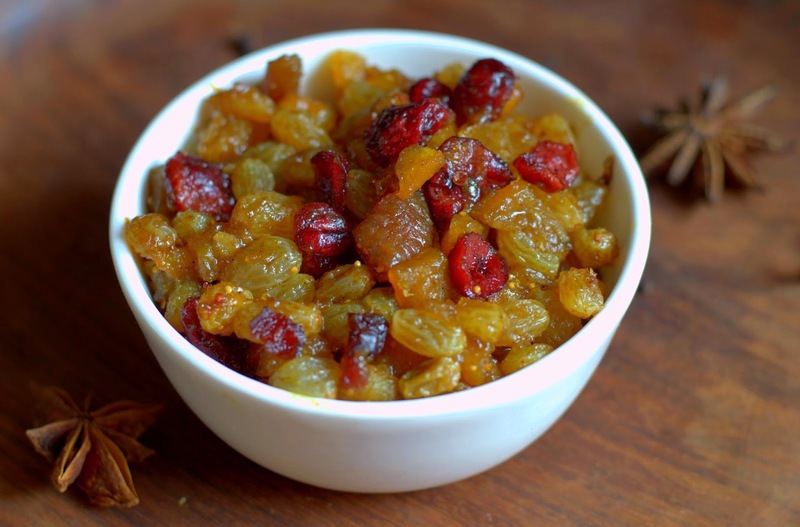 Mincemeat, a spicy fruit preserve is commonly made with dried & fresh fruit, candied peel, spices, apple/orange juice, alcohol, orange zest, butter and sugar. This traditionally was made with meat as one of the ingredients, giving it the name. Suet or kidney fat later came to be used in place of the meat. 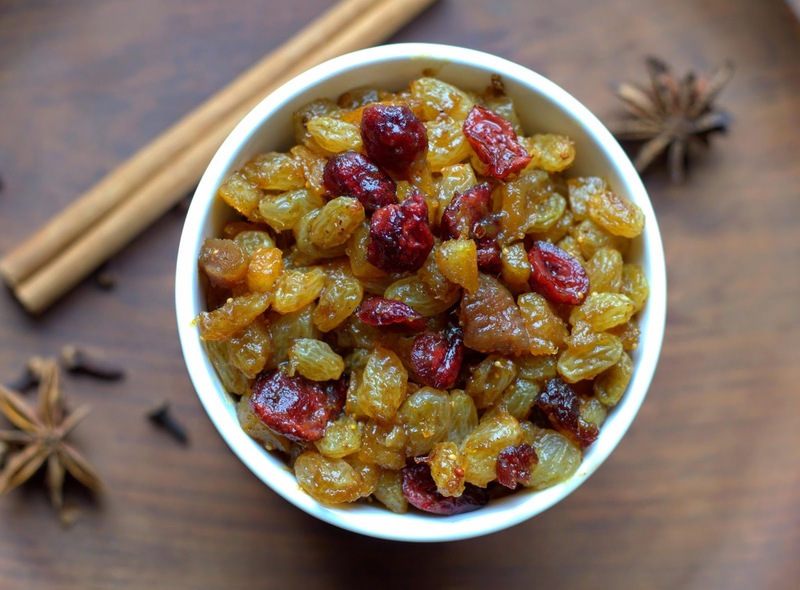 The dried and fresh fruit can be raisins (the major component), sultanas, cherries, cranberries, currants and figs. Grated or cubed apples are also used to give more texture and body. Spices could be allspice, cinnamon, nutmeg and ground cloves. Chopped nuts like cashew should be a lovely addition for some nuttiness and help temper the sweetness. Use orange juice or rum and brandy as you wish. When soaked in alcohol, mincemeat can be allowed to mature for days and months in sterile jars. Without alcohol, this is best refrigerated and consumed within a couple of days. The recipe is fairly simple and can be tweaked infinitely. I have used raisins, figs and candied peel, feel free to swap for fruit you prefer, using sugar accordingly. Alter the amounts of spices to taste, less is better as you can always add more once you taste the preserve. The best thing about this recipe it is vegetarian, quick and easy, making candied peel the only time consuming part. You could make mincemeat well ahead if making with alcohol or even at the last minute literally as all it needs is a night for it to be ready to use. Ingredients : To make a generous cup of mincemeat. Halve the recipe if it is your first batch of mincemeat, double if you adore anything fruit and spice! Method : Whisk together the orange juice and zest, ensure there are no clumps of zest. Take all ingredients in a heavy saucepan, mix and cook on low heat for about 3-5 minutes or till the raisins are plump and there still is some juice remaining in the saucepan. Be careful not to dry out the fruit as it will become chewy (but still tasty) . If making with lesser quantities, cook for lesser time. Larger quantities of fruit will take longer. Take off the heat, stir in a couple of tablespoons of orange juice. Let cool. Transfer to a clean jar, refrigerate at least overnight or up to 3 days. If using alcohol in place of the orange juice, you can store it in the refrigerator for a month. Top up with more alcohol after a week to keep the fruit moist. Drain if needed, use as you wish! There is more Christmas baking coming up, please do drop by again!